Urban Land Conservancy purchased Race TOD in April of 2015 with support from the City and County of Denver. This also marked ULC’s second acquisition using the Calvert Foundation’s Facility Fund. 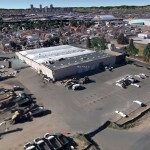 The transit oriented development (TOD) is located approximately two blocks from RTD’s proposed 48th and Brighton commuter rail station on the N Line, which is expected to open in late 2019. ULC is working to identify a development partner that will support our mission for equitable development on the 6 acre TOD site at 48th and Race in Denver. The Colorado Construction Institute offers construction based educational programs for Denver youth and adults, helping the city face its current labor shortage. ULC will host the Denver premier of the documentary Arc of Justice on May 20 and May 21, this film showcases the origins of the Community Land Trust. ULC worked with residents, business owners and stakeholders in Denver’s Elyria Swansea neighborhood to create four design concepts for the redevelopment of Race Street TOD.